It’s a big day in tech, all the way around. We’ll continue our mission to “Think Big” here in Las Vegas at the IBM Information On Demand 2012 event. We’ll also get a glimpse into how big the mobile market is becoming as Facebook announces its earnings after the bell later today. But of course, one of the biggest stories of the day has to do with the downsizing of one of our favorite tablets, the Apple iPad. If you’re using an Apple device (including an AppleTV), you should be able to tune in to watch the announcement live starting at 10 AM PST. If not, there will be shortage of bloggers out there giving you the blow-by-blow. Why am I so interested in the Mini iPad? First, Apple set the bar for tablets with the original iPad, which I still use to this day. Second, the smaller form factor is raising a lot of questions about price. Can Apple afford to take down the price from $499 to the $200 range, especially when their iPod Touch is still priced at $299 (the last time I looked…I can’t look this morning, as the Apple store is down getting busy for the Mini introduction). I’d say the question more is, can they afford not to? Like the early browser wars, this is a market AND mindshare battle. iOS and Android are lined up for a full cage death match, and if Apple’s to maintain its market share lead of 69.6% (as of Q2 2012), they’re going to have to compete aggressively on price. The new Nexus 7 and Kindle Fire HDs are coming in at under $200, and while I doubt that’s a price Apple can match, they’re going to have to strive to stay somewhat price competitive, figuring the Apple premium could be worth $100 per unit or so. Third, the original iPad was the starting line of the shift away from desktop-centric technology, and as Microsoft attempts to come into this market with its Surface tablet, a key question emerges: Can Apple continue to entice productivity hounds away from the Microsoft ecosystem, despite the advent of the Surface, and stay price competitive in a burgeoning competitive market? As for me, you might ask, will I buy one? I’ll never say never. The iPad has become a full-on personal entertainment and productivity workhorse for me, an elegant blended use case of both the personal and the professional. I watch movies on the thing, I use it for blogging and broadcasting, I play games, I do email, I read books, I hold conference calls. There’s not a lot I can’t do on it. So, I can easily justify the upgrade, and I’d love to get a faster iPad, but like with the original, I may wait for an initial software upgrade so Apple has the opportunity to work some of the kinks out. Then again, I may not. This just in from TechNet, a bipartisan policy and political network of technology CEOs that promotes the growth of the innovation economy. 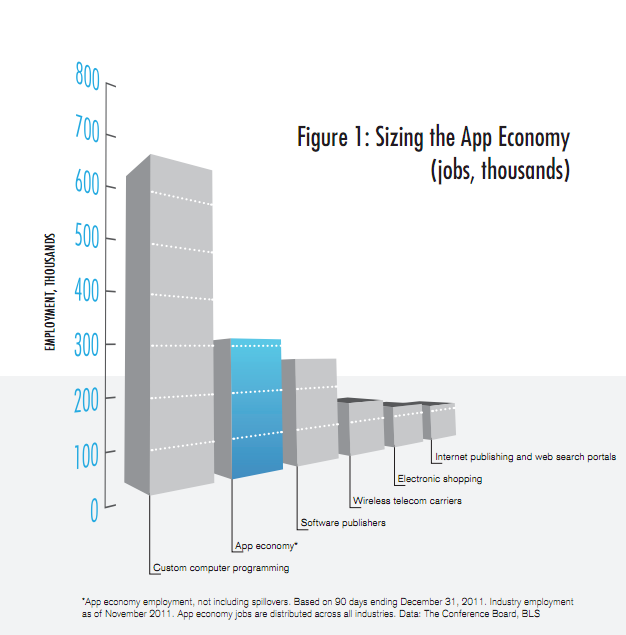 TechNet's new report, "Where The Jobs Are: The App Economy," reveals how smartphones, tablets, and other devices are creating a wealth of new jobs in the U.S. They released a study yesterday showing there are now roughly 466,000 jobs in the “App Economy,” as they refer to it, in the United States. That’s up from “zero” in 2007. Remembering, of course, that the iPhone wasn’t introduced until June 2007 (and I guess the BlackBerry before that didn’t count!). In terms of U.S. urban centers, the top metropolitan area for App Economy jobs turns out to be New York City (9.2 percent) and its surrounding area, although San Francisco and Silicon Valley combined make up for 14.8 percent. In terms of states, of course, California runs away with it at 23.8 percent, followed by New York at 6.9%. 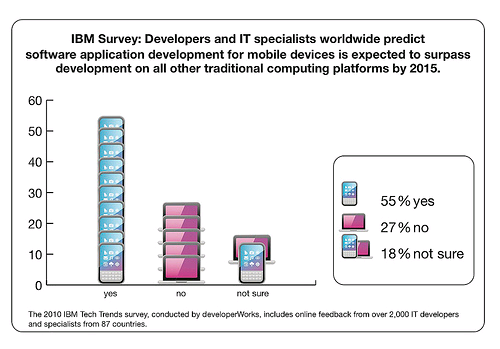 The research also revealed that when it comes to employment impacts, each app represents jobs across a wide spectrum of roles: programmers, user interface designers, marketers, managers, and support staff. They include jobs at “pure” app firms like Zynga (which makes games for Facebook) as well as app-related jobs at large companies like EA, Amazon, AT&T, as well as app “infrastructure” jobs at firms like Google, Apple, IBM, Facebook, and others.